While I'm always taking inspiration from the bloggers I follow, since deciding to give my blog a bit of an overhaul I feel I've been doing so more than ever, and I thought it would be nice to share a few of my favourites with you. One of my most recent but also biggest sources of inspiration is Kate Arends, the creator of the beautiful site, Wit & Delight (notice the rhyme there?). Wit & Delight is a lifestyle blog which promotes a 'life well lived', and is always full of beautiful products, interiors, clothes and reflections. Every post is written in an eloquent and intelligent yet personable way, and completed by beautiful photographs or Polyvore-esque flat-lays. You can see just how much thought and effort goes into everything Kate creates, and the end result of that is a very elegant and classy webspace, which I am massively inspired by; if Namaste, Rowan becomes half as gorgeous and Wit & Delight, I would be one very happy lady. I came across Ella's blog a couple of months ago, and straight away I was inspired by not only her style of photography, which has inspired me to get back into film photography, but also her way of thinking and her open, positive outlook. Ella writes a variety of posts, with the main themes being wellness (both mental and physical), her personal style, and travel. I always get a sense of warmth and kindness when I read Ella's blog, and she always inspires me to be a more open and kind person, and to keep working towards a healthy, balanced life. I'm not really a follower of fashion and don't follow a lot of 'fashion' blogs, but I do have a soft spot for Paulien's blog, Polienne. Being from Belgium, Paulien's style is typically Northern European - minimal, effortless, and always spot-on. I sometimes (often) get stuck in a bit of a clothing rut and end up rotating the same handful of outfits, but I can always find inspiration as to how to change things up a bit and make myself look that little bit more put together on this blog. Paulien doesn't just write about fashion, though; she keeps things varied by also posting interior inspiration, photographs from her travels and the odd beauty post. What more could you want? Alongside her Youtube channel, Hello October, Suzie also runs a blog by the same name, where you can find beauty, fashion and lifestyle posts. Suzie is a very down-to-earth person, and something about her posts makes me feel really cosy and homely, particularly her 'Sunday Post' series, where she shares what she's been up to and often some of the cutest cafes, which I always try and make a mental note to visit the next time I'm in Brighton. Although she recently left her job to pursue Youtube and blogging full time, Suzie still posted regularly while working full-time and her content never suffered, and whenever I start to feel like I'm struggling to juggle working and blogging, I think of Suzie and all of the other bloggers out there who do exactly that and succeed in both. 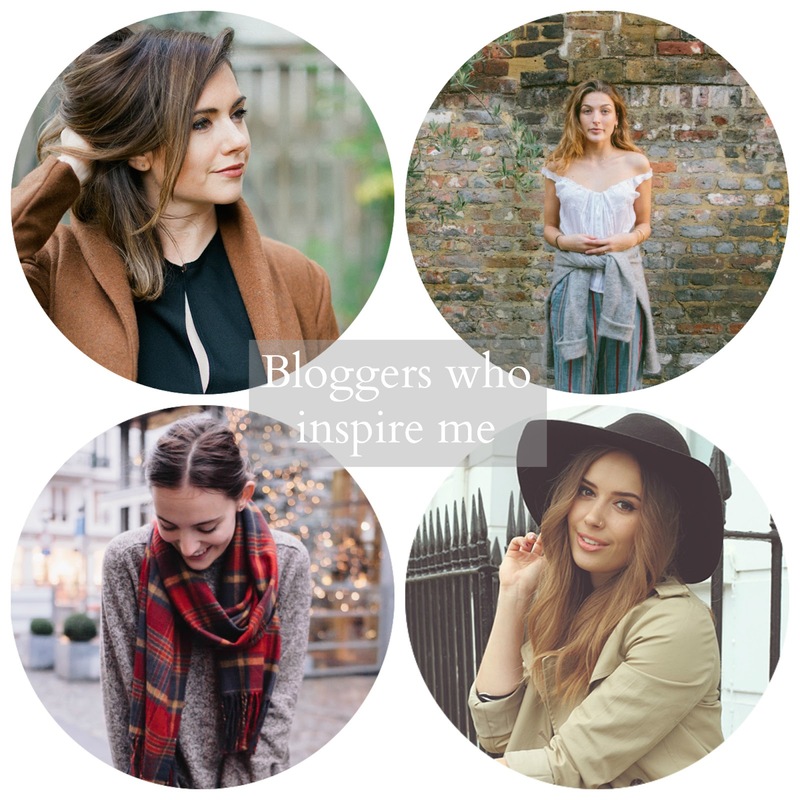 These ladies are just a few of the bloggers who inspire me, and if you guys liked this post let me know and maybe in the future I can share more. In the mean time, why not let me know who you're inspired by? I hope you all had a wonderful Christmas and that you're all excited for the New Year - I'm already planning some positive changes!